Why is Sugar Bad for Your Oral Health? As we begin our exploration into the dangers of sugar, let’s first establish what type is the most detrimental to your oral health. The category of sugars that you want to avoid the most are the simple ones. They are referred to as simple because when consumed they rapidly are converted to glucose (pure sugar). The speed with which they are broken down is one of the determining factors in how useful they are for your body. 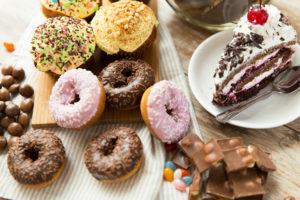 Sugars that are metabolized fast don’t offer much sustained energy to power your body, but they serve as great sources of food for bacteria, providing the sustenance needed for them to grow and multiply. The bacteria then go on to become the nemeses of your oral health, attacking your teeth and gums and forming into plaque clusters. The sticky plaque film then settles all over your mouth and contributes to the decay of every surface it makes contact with. There are ways to fight back, though. Consistent Oral Hygiene – You don’t have to completely abstain from eating sweet treats. When you decide to give in, your consistent oral hygiene habits (which should include brushing and flossing) will help to rid your mouth of the harmful bacteria agents that the sugars will attract. If you can’t brush and floss after every meal, you should at least keep some mouthwash handy to rinse away as much leftover food as possible. Healthier Food and Beverage Choices – If you’re craving something sweet to eat or drink, there are tons of healthy alternatives. Instead of having a slice of apple pie, you can munch on a juicy apple by itself; and you can replace a strawberry milkshake with a strawberry smoothie. The natural sugars in fruits don’t have nearly as detrimental an effect as the processed kind found in snack foods. Visiting Your Dentist – A final way to combat the harmful effects of sugar is to visit your dentist regularly for cleanings and checkups. These appointments will serve several purposes. They’ll remove any plaque and tartar that may have developed due to bacteria growth, and if you have problems with overconsuming sugar-filled foods, these visits are even more important. They’ll provide you with an added layer of defense against the host of problems that could arise from excess bacteria growth, including cavities, gum disease, tooth loss and other issues. To get the help you need to overcome the dangers of sugar consumption, reach out to your local dentist to schedule your first preventive care visit today! Drs. Kathy Lam and Jason Hong offer an array of services to help guide you in your quest for excellent oral health. For more information about the care they provide, you can contact them through their website.